A 51-year-old trader and mother of three, Sarah Bakare, who lives on Oluwole Street in the Ejigbo area of Lagos State, narrowly escaped being hacked to death recently, by the landlady and her seven children. Narrating the incident, the victim told Crime Alert after she was discharged from hospital that she was lucky to be alive to relive her ordeal. She recalled that trouble started after she rented a room and parlour self- contained apartment last year January for which she paid N250,000. According to her, “A few months after I moved into the house, I began to experience different attacks from the landlady, Madam Lydia Opetola, and her children. It all started in the month of March last year when I noticed that one of the landlady’s sons was fond of peeping through the door each time I was in the bathroom. At first, I ignored it but when it continued, I brought the issue to the notice of his mother. Instead of calling her son to order, she accused me of not allowing her children to live in peace in their father’s house. So, I went to the agent to complain because before I rented the apartment, I made enquiries through the agent and he assured me that the house was okay, not knowing he was only interested in the commission. “From peeping scenario, the landlady’s children began to turn off the source of water which also happened each time I was in the bathroom as midway, the water would stop flowing and I would have to come out of the bathroom with soap all over my body. “One Sunday, I returned from church and discovered that that they had inserted sticks in the pipes outside and blocked flow of water to my bathroom and kitchen. At this point, I invited some landlords in the area to come and see what was happening and that the attacks and humiliation had become unbearable for me. Seven of the landlady’s children attacked me for calling the landlords and allowing them into the compound. My landlady walked out on them, saying she had nothing to discuss with them. The landlords then advised that if they didn’t want me to live in the house any longer, they should refund the rent I paid so that I could move out instead of not allowing me to have peace. Their response was that they did not have the money to refund and that I should continue till November when my rent would expire. In the month of August when my landlady requested for money for electricity bill, I told her to use part of my outstanding N15,000 balance with her. “About two weeks ago, they disconnected electricity supply to my apartment. When there is power supply I won’t have electricity. I kept mute as I could not query them for fear of being attacked. On Thursday, October 14, I didn’t have water. So, I went to fetch water from the tap outside my apartment. Immediately I opened the tap, one of the landlady’s sons, Folorunsho, hit me with a plank and I fell down. Before I realised what happened to me, all the seven descended on me, hitting me with different objects. I started shouting for help but as I was shouting, they put on their generator so that people would not hear my voice. While this was going on, the landlady kept threatening that they would kill and bury me inside the compound and nobody would know. They also attacked my daughter who ran to my aid when she heard my cries. One of them broke a bottle which they used to stab me on the face. 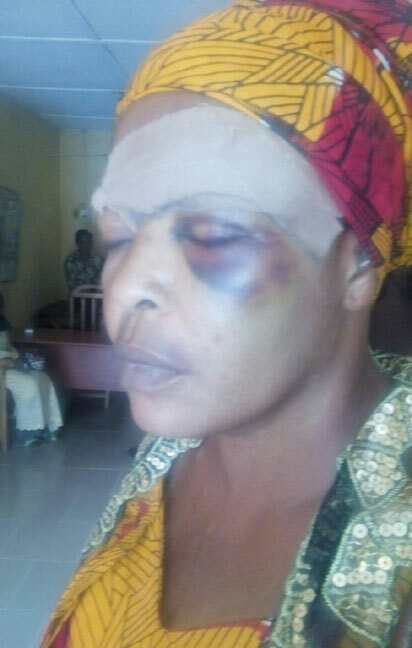 Another eyewitness who gave her name as Mrs Kashimu also alleged that Mrs Opetola and her children were brutal. She said, “It was my son who called my attention to what was happening. But I did not take it serious until he told me that our neighbour who went in to help was beaten up. Thank God for some neighbours who alerted the OPC men. I feel it was a planned work, an attempt to kill Sarah. When Crime Alert visited the scene of the incident at No 21, Oluwole Street, Ejigbo, neither the landlady nor her children were available for comment. It was said that the entire family had disappeared after they were released on bail and told to report to the police station on Monday, last week. Sarah said she suspects foul play in the way the Police in Ejigbo Division is handling the matter. “The police told me that the lawyer who came for the release of my landlady and her children dropped a fake address and that when he was contacted by the IPO whose name was given as Sergeant Joy, he told them his clients were not disposed to appear at the station. “When my landlady and her children were released last Friday and got back to the compound on Saturday, I was in my room when I heard the children asking if I was still here, and that they would kill me. I called the IPO and informed her. The police came to the house this Monday, my landlady and her children did not show up at the police station. When Crime Alert contacted DSP Joseph Offor, the Lagos State Police Public Relations Officer, for his comment, he did not respond to calls and text messages sent to him.